Pizza is a FAVORITE around here. Whether it be take-out, gourmet, or homemade we are always up for pizza. Today we wanted to share with you 3 different ways to make homemade pizza dough. Depending on your time frame and preferences one of these will for sure be a hit! The fastest way to make pizza dough is with Thrive’s new Country White Bread Dough. All you have to do is add water and yeast. It’s so easy even Julie’s boys help make it. The dough is great for bread, rolls, scones, doughnuts, cinnamon rolls and PIZZA DOUGH. We like this as an option when we really didn’t plan ahead and want a quick meal we know our family will love. Use this dough with any of your favorite pizza toppings and sauces. Jodi’s family loves deep-dish pizza and her favorite recipe is this one modified from our friend Crystal at Everyday Food Storage. 1. Pour medium hot water in mixing bowl. Sprinkle yeast on top and allow to dissolve. 2. Add sugar, salt, and oil. Gradually add approximately 6 cups of flour. 3. Melt 1/2 cube of butter on cookie sheet in oven as it is heating to 400 degrees and melt in oven. 4. Place dough on cookie sheet and press to fill pan, make sure butter gets on top of the dough. 5. Add your sauce, cheese, and toppings. 6. Cook for 10 to 12 minutes or until cheese is slightly browned and the crust is firm. * When using regular yeast change amount to 2 Tbsp. Makes enough dough for two pizzas, or one pizza and some breadsticks. 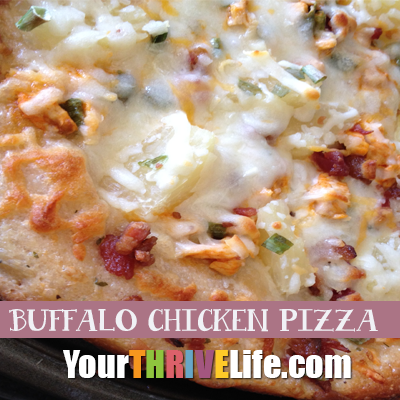 Julie loves to use our favorite bread recipe for her pizza dough. It’s 100% whole wheat and it makes a big enough batch she gets bread, pizza, and cinnamon rolls out of HALF a batch. She has also been known to make calzones and freeze them for quick lunches with the dough. This recipe originated on the Deals to Meals blog, directions are modified for Julie’s methods. Spray counter with pam and take dough out of the bowl. Do NOT flour your counter, this will add dryness you don’t want in the dough. If you are making half the recipe, you can make up to 3 pizzas. Roll out the dough and top with your favorite sauce and toppings. You don’t need to let the dough rise very long but you can if you like a fluffier dough. I also like to make the dough in the morning, stick it in the fridge, then pull it out about 40 minutes before putting it in the oven to allow for it to warm and rise a little. For full instructions on making bread instead of pizza with this recipe, visit this link. So there you have it. Whether you have 5, 15, or 25 minutes to get your pizza dough ready we think one of these will be a great option for you. Enjoy and share!